Every year we look back to see what we have accomplished and look forward to what we will be taking on in the coming year. 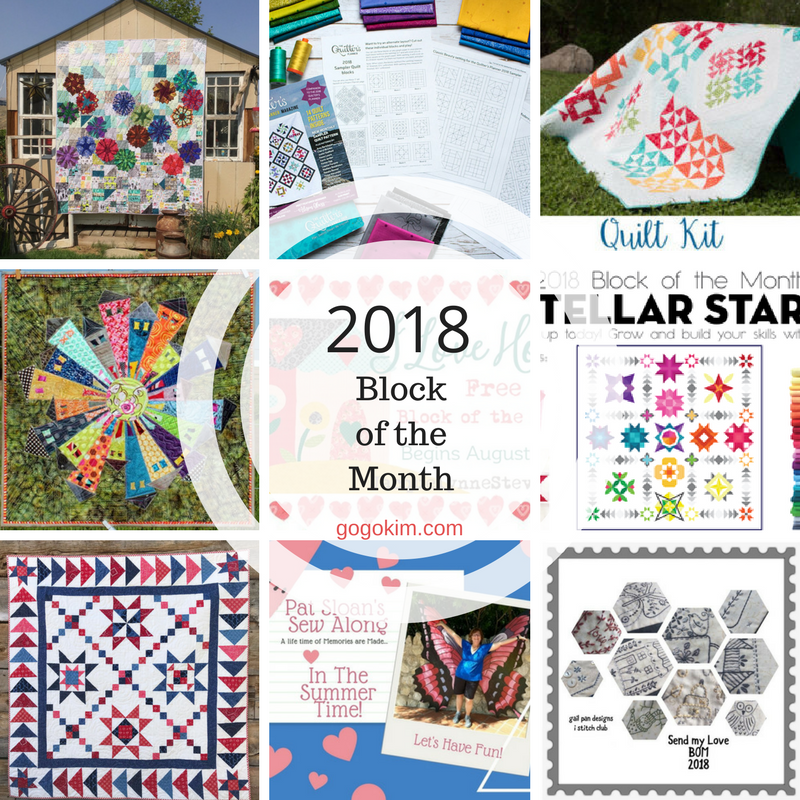 In 2018 there is a plethora of fun Block of the Month and Quilt Alongs that will keep you entertained, engaged and inspired for the entire year! Some of these are free and some are a paid subscription. All of them are incredible! 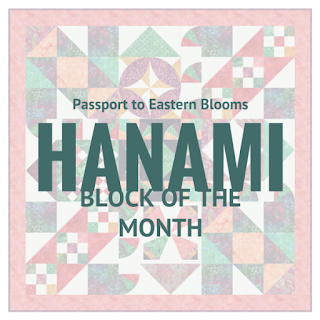 For something a little different, Gail Pan has an embroidery Block of the Month! Take some time to sit down and enjoy stitching up these precious embroideries! 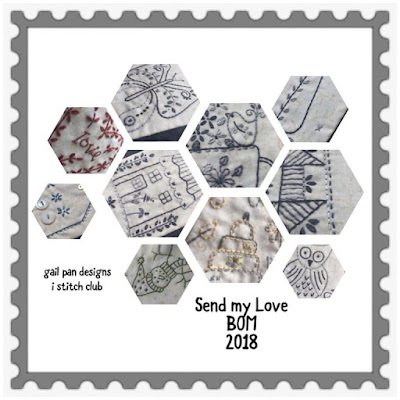 You can join this BOM or Stitch of the Month by visiting Gail Pan Designs. Welcome to my new “i stitch” PDF Club. I hope you enjoy the BOM “send my love” that I have designed for 2018. Each month for 12 months, starting January 2018, there will be 3 embroidered tag designs as well as one small pattern that will use one of the designs. You may use whichever design you like for the small patterns. In December there will be a quilt pattern for all the designs. Kim from Persimion Dreams will be hosting a fun Sew Along for her Dresden Neighborhood Mini Quilt! You can join in by visiting Persimon Dreams! In 2018 I’m going to run a #DresdenNeighbhoodSAL. That’s right! 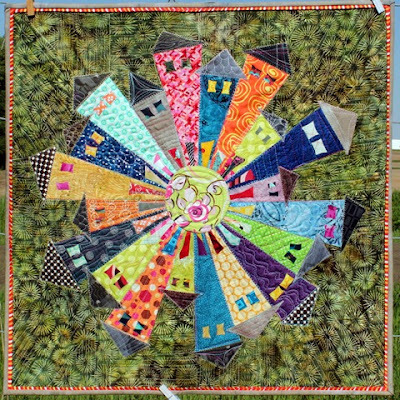 I’m going to sew 12 Dresden Neighborhood blocks in 12 months! By the end of 2018 I’ll have a full size 72” x 96” quilt (at a minimum … there may be some border treatment options) and I’d love to have you join in. My good friend Pat Sloan is back again with a FREE BOM called Let's Go Camping! Pat always has the best BOM and stories to go along with them! Start packing your camper with the details by visiting Pat Sloan's website! Want to try Triangles? 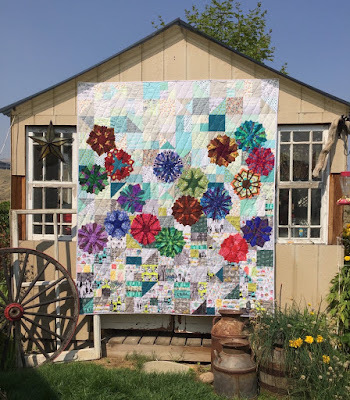 Becca Bryan from Bryan House Quilts has a the perfect way to use lots of color ( we all love color) and angles galore! Get your angle on by visiting Bryan House Quilts! During the first 5 months we'll make 25 triangle blocks. The triangle patterns can all be found in my book, Modern Triangle Quilts. During the next 6 months we'll puzzle the colored triangles together into rectangle blocks. Finally, the last month will be devoted to quilt assembly and the final reveal. I'll also show how I colored the quilt and give you a few fun tips. The Quilter's Planner has been a huge part of my life this past year and will be again in 2018! It helps you keep track of life ( no small task) but also encourages you to make the time to do what you LOVE the most! 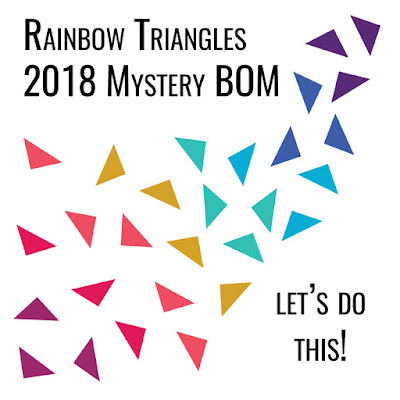 They hosted a lovely BOM last year and are doing it again this year! I am super exciting to be joining this one and hope you will too! You can find more information by visiting The Quilter's Planner! 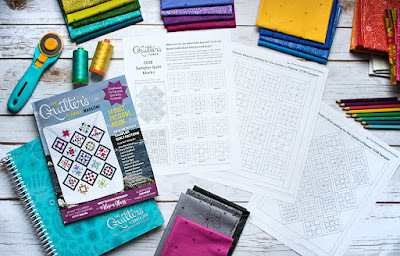 We’re hoping you’ll join us on Facebook and Instagram as we sew the 2018 QP Sampler Quilt Block of the Month (BOM) pattern. We’ve even made these free downloadable coloring pages to make it easier to plan your version of the 2018 sampler quilt (see below for the download). Check out our Facebook group and Instagram for tips with you for sewing a beautiful sampler. You can get support and help along the way by asking our QP experts and group members. You can join in at any point during the new year. It’s never too late. Jacquelynne Steves always has fantastic BOM that feature a variety of ways to make blocks! I joined her BOM in 2016 and it was a BLAST! I even taught myself to thread paint! Check out my How to Thread Paint! Join Jacquelynne Steves I Love Home! 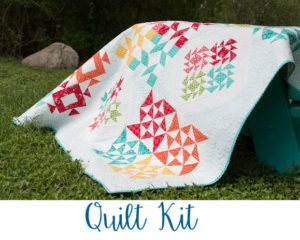 I LOVE this new product and quilt BOM from Heather Valentine and Amy Ellis! 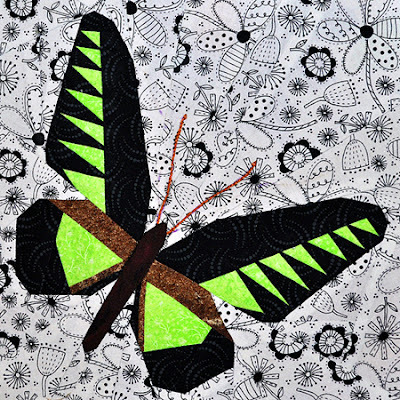 Inspiring Stitches made its debut at Fall Quilt Market and was a very HOT item! This sweet calendar includes lovely quilt blocks! 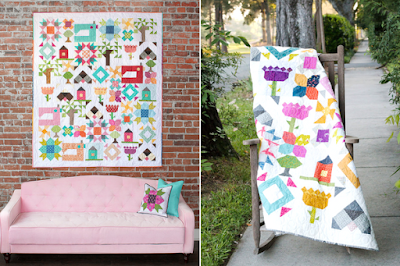 Heather and Amy are hosting a fun quilt along to go along with their blocks in the calendar. Get your Inspiring Stitches Calendar and start planning your Heartland Heritage quilt! The second Wednesday of each month, Amy and I will be posting our new blocks, made with fresh fabrics and a helpful hint or tip as needed. We are calling it our Sewday, and hope that you will join us. As you can see from the pictures above we both have a similar style but tend to pull from different areas of the color wheel. It’s really fun to find that we have the same fabric in different places in our quilts. Cristy Fincher is bringing in the New Year with a stars! Lots and lots of beautiful stars! Join the Stellar Stars Club by visiting Purple Daisies Quilting! Stellar Stars is a dynamic quilt filled with 16 different skill building blocks that will excite and challenge you. Each month, beginning January 12th, you’ll receive a new block (some months you’ll receive 2 blocks!) to create, as you sew your way to making your own Stellar Stars quilt. Whether you’re a new or experienced quilter, building your piecing skills and confidence is what this BOM is all about. By the end of the year, you’ll have learned some new skills and fine tuned a few old ones as well. Plus, you’ll have an amazing quilt to show for it! 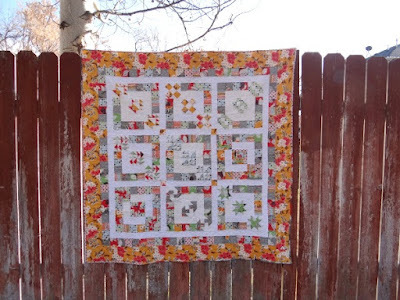 Becky from Patchwork Posse has a fun FREE Block of the Month! 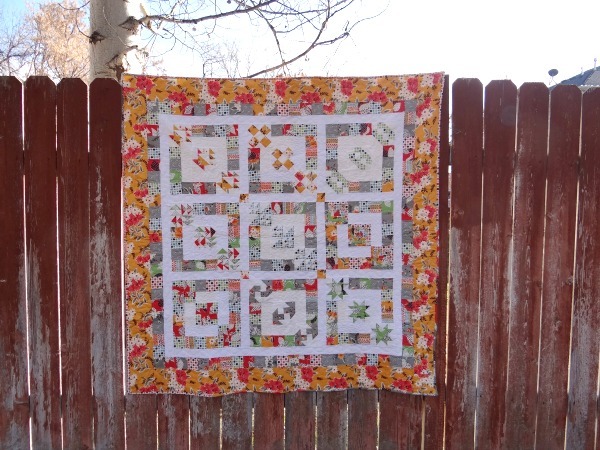 Three's Company Block of the Month is starting soon so be sure to visit Patchwork Posse to find out all the details! Katja Marek has a delightful Block of the Month for her book Distinctive Dresdens! To sign up for this Sew Along visit Katja's Quilt Shoppe! Rainy Days and Sun Days is a free online quilt-along based on my book Distinctive Dresdens (the book is required to make the blocks). Monthly instructions will be posted starting January 2018. Rainy Day Umbrellas 72" x 84" a bed sized quilt easily made larger by adding a plain or pieced border. Sun Day Parasols 42" x 72" a companion wall-hanging for the bed-sized quilt. Sarah Fielke has a FANTASTIC new Block of the Month that is sure to make you happy the New Year has started! 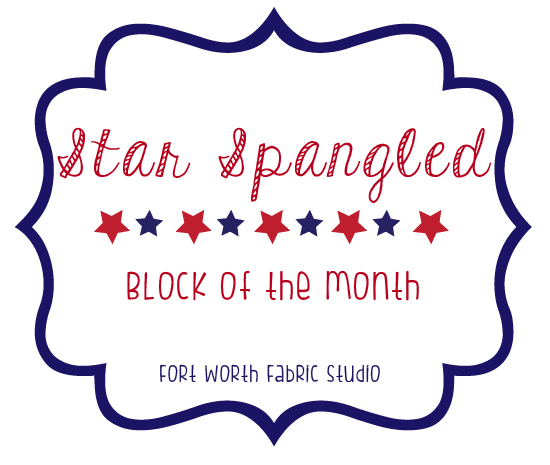 Fine out more about this sweet Block of the Month by visiting Block of the Month by Sarah Fielke! Unlike most Blocks of the Month, a Sarah Fielke BOM starts from a hand drawn sketch. 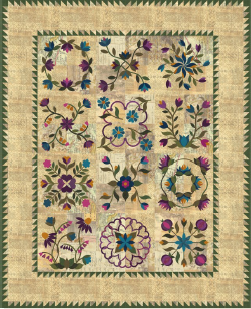 Each month a new section of the quilt is revealed through PDF patterns and instructional videos, hosted on a private website. The delivery format allows you to work with your own fabric, meaning your quilt will be a reflection of your personal style and colour taste - and it saves on shipping! 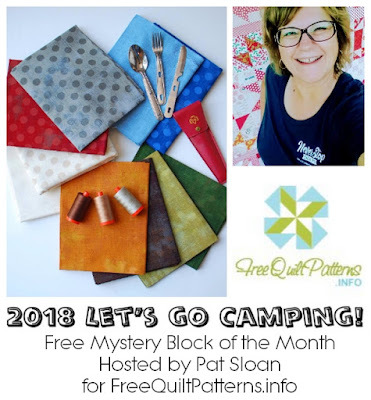 Work through the quilt at your own pace with help from Sarah, while chatting and sharing with other quilters through a private Facebook group. Ebony Love will be dazzling us in the Hanami adventure! Everyone needs an adventure every now and again! Grab your passport and visit Love Bug Studios to board your flight to fun! 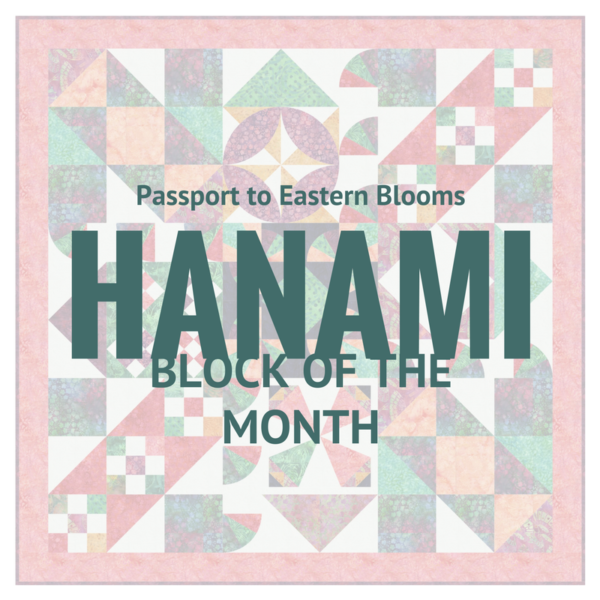 Join us on our Hanami adventure with a skill-building BOM and eight complementary quilt patterns representing each region of Japan, as breathtaking as the blooms themselves! You’ll receive a passport for your travels, and you may join us as a Guest, Tourist, or VIP! The BOM quilt finishes at 58″ x 58″. 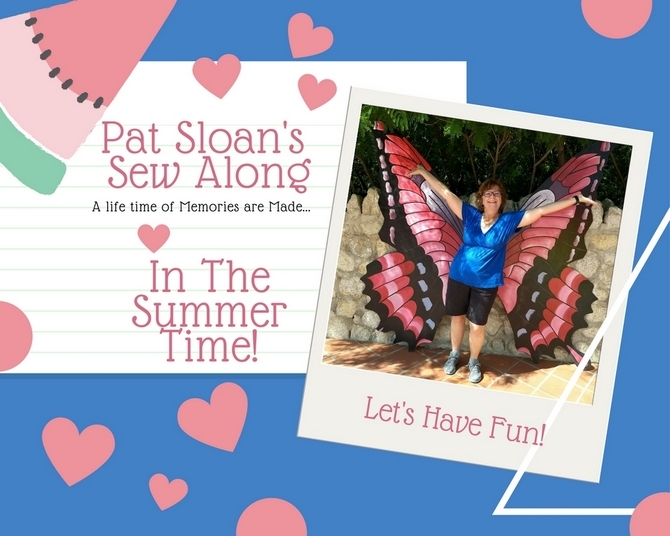 Pat Sloan has a second FREE BOM that is a great way to get through the Winter months! Visit I Love to Make Quilts to find out even more about what you will need to get warm in January! 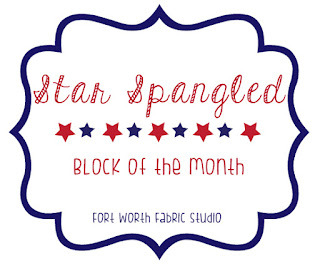 Fort Worth Fabric Studio's Block of the Month Star Spangled is a five month commitment to make a great quilt fully ready for July 4th! For more about this quilt, please visit Fort Worth Fabric Studio! Do you love to paper piece? Claudia's Quilt has a FREE Butterfly Block of the Month that will be starting in February! You can find all the details by visiting Claudia's Quilts. with them as motiv the next series again are butterflies. will be a little bit more colorful than in my "Big Quilt of Nature" because I chose exotic species. and one paperpiecing pattern for the sashings, if you like to assemble the quilt my way. The Quilt Show is introducing a new Block of the Month program for their Star Members! When you join you will have access to monthly blocks by the fabulous Edyta Sitar! Visit The Quilt Show website for more information about making this stunning quilt in 2018! 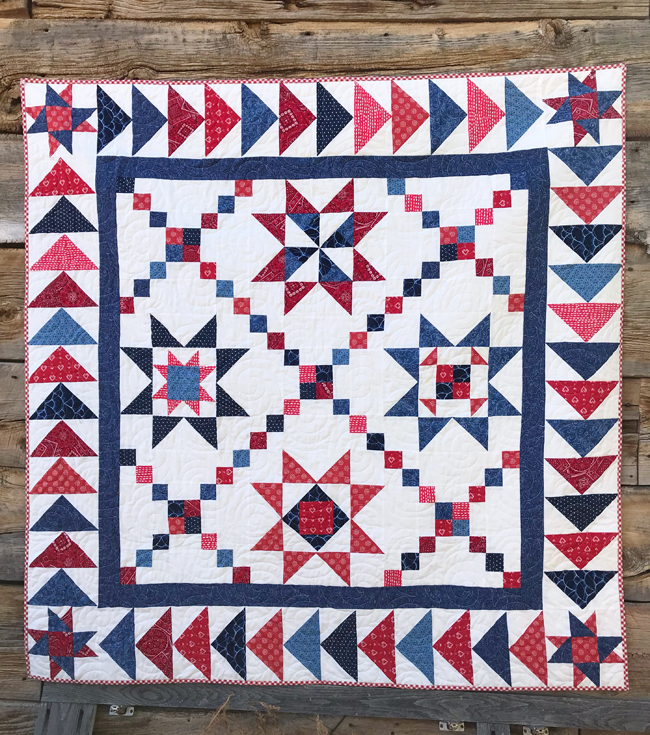 Join us on a TQS exclusive 12-month creative journey along America’s back country roads as we bring you "The Patchwork Barn Quilt," a fabulous quilt designed especially for TQS by Edyta Sitar. A spectacular sampler quilt featuring a barn nestled among rows of ‘crops’ (blocks). Edyta’s design inspiration was the result of observing the wide variety of quilt blocks painted on the side of barns while traveling across the country. 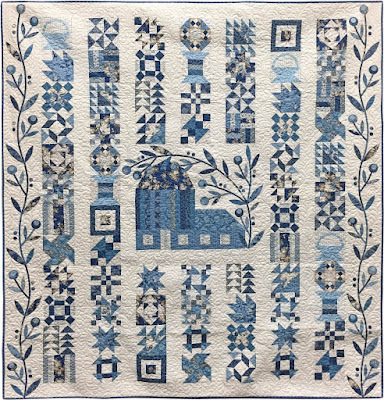 Known for her love of colorfully elegant scrap quilts, Edyta has this time used her magic touch by combining a wide variety of blue and cream fabrics set against a neutral background. 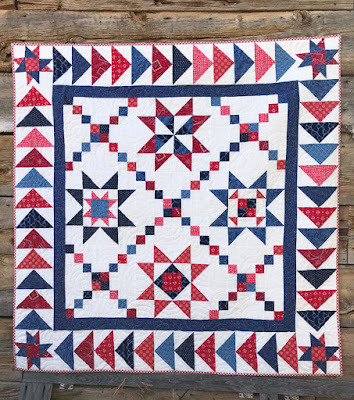 The resulting design is a stunning, but quieter, scrap quilt that is sure to be a family favorite for generations to come. Each month we will provide photos, detailed directions for a portion of the quilt, and full-size patterns. 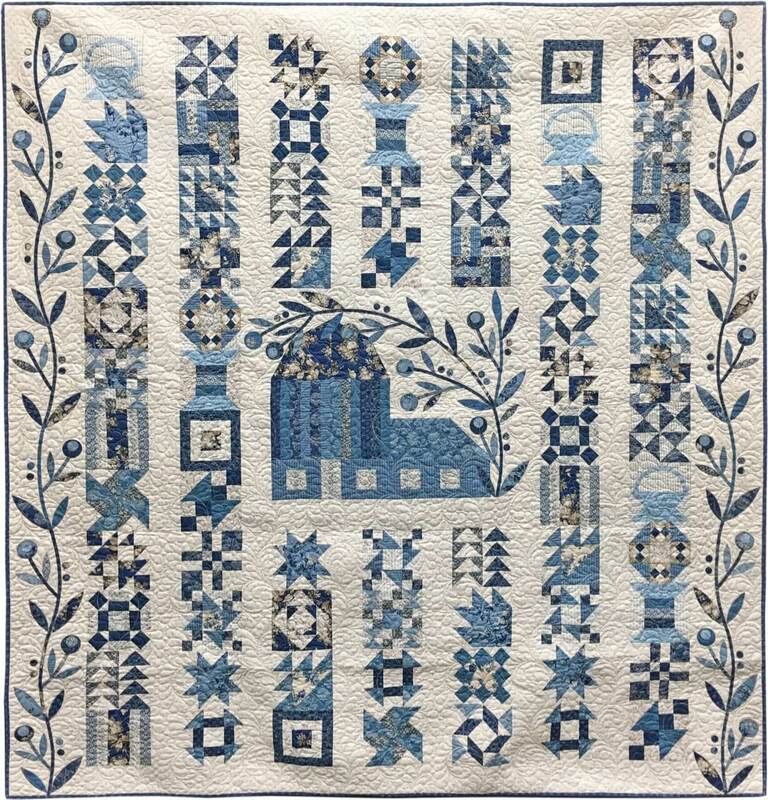 Sue Pellan Designs has a Block of the Month for a lovely traditional quilt using her specialized tools. My Magical Garden starts in March but you can join and find more information by visiting Sue Pellan Designs. I will be adding to this list as I find more BOM and Sew Alongs that you will love! This is a great list - so many opportunities! I keep watching for lists like this in the hopes that I'll find a group of quilters wanting to work through the Dear Jane quilt as a BOM. I have the software and the fabric but am intimidated by the magnitude of the project - some quilty friends for accountability and support might help. :-) Happy New Year Kim! Hi Jenni! Thank you so much for stopping by and commenting! That would be a tall order for the Dear Jane! I do completely agree that the accountability part for that quilt in particular would be most helpful! HAPPY NEW YEAR! ACK! I want to do them all!!! Thanks for all these wonderful BOM sew alongs. I've got my eye on a couple of them! So many fun projects to consider! Thanks for compiling them! Nice post. You have done a great job. Loved reading it.